Kelly's Korner: Can You Help??? The mother has stage 4 cancer and has been told she will not live until Christmas. She has two small children - one is a 7 year old girl with special needs. The husband and son also have medical issues. They need first our prayers but there are also some tangible ways you can help if you feel led. Holly and I will definitely be praying for them! On our way to the site right now!!! Praying for them, so sad. So sad... I'll go check out their blog out right now! Do you know what area they are in. I would love to make a meal if they happened to be close by, or do laundry, or pick up groceries. I can help, what are their needs? My 8 y/o daughter's closet is bursting at the seams if they need kids clothes. This breaks my heart Kelly. Thanks for sharing! Thank you for showing me a way out of my funk! How sad and tragic. I will pray for them! 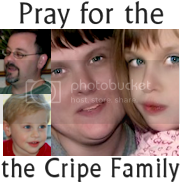 May God bless you richly for getting word out about the Cripe family. You made a difference today. Doesn't that feel good? Kelly, thank you for your heart. Thank you for allowing God to use you. I will be praying for this family. Thank you for sharing with us.